Posted on April 9, 2019 at 11:25 am. The Grand Canonical Adaptive resolution scheme (GC-AdResS) gives a methodological description to partition a simulation box into different regions with different degrees of accuracy. For more details on the theory see Refs. [1,2,3]. In the context of an E-CAM pilot project focused on the development of the GC-AdResS scheme, an updated version of GC-AdResS was built and implemented in GROMACS, as reported in https://aip.scitation.org/doi/10.1063/1.5031206 (open access version: https://arxiv.org/abs/1806.09870). The main goal of the project is to develop a library or recipe with which GC-AdResS can be implemented in any Classical MD Code. The current implementation of GC- AdResS in GROMACS has several performance problems. We know that the main performance loss of AdResS simulations in GROMACS is in the neighbouring list search and the generic serial force kernel, linking the atomistic (AT) and coarse grained (CG) forces together via a smooth weighting function. Thus, to get rid of the bottleneck with respect to performance and a hindrance regarding the easy/general implementation into other codes and thus get rid of the not optimized force kernel used in GROMACS we had to change the neighbourlist search. This lead to a considerable speed up of the code. Furthermore it decouples the method directly from the core of any MD code, which does not hinder the performance and makes the scheme hardware independent. This module presents a very straight forward way to implement a new partitioning scheme in GROMACS . And this solves two problems which affect the performance, the neighborlist search and the generic force kernel. Information about module purpose, background information, software installation, testing and a link to the source code, can be found in our E-CAM software Library here. E-CAM Deliverables D4.3 and D4.4 present more modules developed in the context of this pilot project. Posted on March 28, 2019 at 3:04 pm. The Innovation Radar aims to identify high-potential innovations and innovators. It is an important source of actionable intelligence on innovations emerging from research and innovation projects funded through European Union programmes. Posted on March 28, 2019 at 1:35 pm. A procedure for the construction of a particle and energy reservoir for the simulation of open molecular systems is presented. The reservoir is made of non‐interacting particles (tracers), embedded in a mean‐field. The tracer molecules acquire atomistic resolution upon entering the atomistic region, while atomistic molecules become tracers after crossing the atomistic boundary. The simulation of open molecular systems requires explicit or implicit reservoirs of energy and particles. Whereas full atomistic resolution is desired in the region of interest, there is some freedom in the implementation of the reservoirs. Here, a combined, explicit reservoir is constructed by interfacing the atomistic region with regions of point-like, non-interacting particles (tracers) embedded in a thermodynamic mean field. The tracer molecules acquire atomistic resolution upon entering the atomistic region and equilibrate with this environment, while atomistic molecules become tracers governed by an effective mean-field potential after crossing the atomistic boundary. The approach is extensively tested on thermodynamic, structural, and dynamic properties of liquid water. Conceptual and numerical advantages of the procedure as well as new perspectives are highlighted and discussed. Posted on March 20, 2019 at 11:26 am. Get the latest news from E-CAM, sign up for our quarterly newsletter. Posted on March 14, 2019 at 10:00 am. The workshop scientific report from the E-CAM State-of-the-Art Workshop Improving the accuracy of ab-initio predictions for materials, that took place on the 17-20 September 2018 at the CECAM-FR-MOSER Node (France), is now available for consultation and download on our website under this link. The State-of-the-Art workshop in the E-CAM Electronic Structure Work-Package (WP2) gathered together 38 participants from the academic research world, shared in a rather equilibrated fashion among Density Functional Theory, Quantum Monte Carlo and Machine Learning communities, and one industrial researcher from Scienomics. Key topics to the development of the field of computational materials science from first principles were thoroughly discussed, from which the following outcomes have emerged: (1) Importance of computational benchmarks to assess the accuracy of different methods and to feed the machine learning and neural network schemes with reliable data; (2) Need of a common database, and need to develop a common language across different codes and different computational approaches; (3) Interesting capabilities for neural network methods to develop new correlated wave functions; (4) Cross-fertilizing combination of computational schemes in a multi-scale environment; and (5) Recent progress in Quantum Monte Carlo to further improve the accuracy of the calculations by taking alternative routes. Limitations in the field and open questions were also debated, as described in the workshop scientific report. 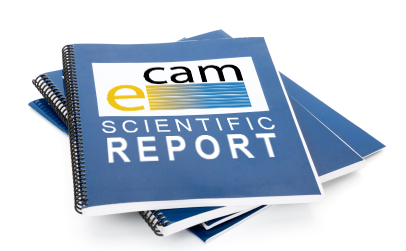 Other scientific reports from State of the Art and Scoping workshops can be found at https://www.e-cam2020.eu/scientific-reports/. The workshop scientific report from the E-CAM State-of-the-Art Workshop Large scale activated event simulations that took place on the 1-3 October 2018 in the CECAM-AT Node (Austria), is now available for consultation and download on our website under this link. The State-of-the-Art workshop in the E-CAM classical molecular simulation work-package (WP1) brought together 40 participants including scientists from non-academic research centres, to discuss computational approaches capable of addressing time scale problems in complex systems in materials science and biophysics. Scientific discussions at the workshop centred around three fundamental computational challenges closely related to the time scale problem of classical MD simulation: (1) The calculation of the populations of metastable states of an equilibrium system; (2) The sampling of transition pathways between long-lived (meta)stable states and the calculation of reaction rate constants; and (3) The extraction of useful mechanistic information from the simulation data and the construction of low-dimensional models that capture the essential features of the process under study. The main outcomes from each discussion are described in the workshop report. Two open discussion sessions revolved on efficient path sampling methods and the identification of reaction coordinates; and how machine learning approaches can be used to make progress in this area. Another important goal of the workshop was to debate about how to facilitate the use of simulation and modelling in industrial settings, with the workshop participants with industrial experience emphasing the importance of detailed project management and, in particular, the need to have very clear agreements about intellectual property rights. 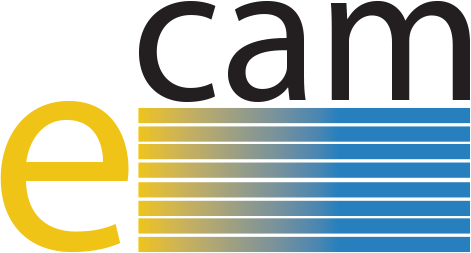 Other scientific reports from State of the Art and Scoping workshops can be hound here: https://www.e-cam2020.eu/scientific-reports/. Posted on March 11, 2019 at 4:12 pm. The porting of DL_MESO_DPD [1,2] to graphic cards (GPUs) was reported in deliverable D4.2 of E-CAM (for a single GPU) and deliverable D4.3  (for multiple GPUs) (Figure 1), and has now been extended to include electrostatics, with two alternative schemes as explained below. This work was recently reported on deliverable D4.4. Figure 1: DL_MESO strong scaling results on PizDaint, obtained using 1.8 billion particles for 256 to 2048 GPUs. Results show very good scaling, with efficiency always above 89% for 2048 GPUs. Posted on February 28, 2019 at 10:41 am. E-CAM is organising an Extended Software Development Workshop in Topics in Classical MD from 3 to 12 April 2019, which is a major coding initiative that will combine lectures; coding sessions and hands-on training. machine learning for molecular dynamics simulatons (including local structure recognition and representation of potential energy surfaces). In addition, this workshop will feature an emphasis on performance testing and benchmarking software, with particular focus on high performance computing. This is a great opportunity to bring your software development project in all specialist domains of Classical MD and spend two weeks in the beautiful city of Lyon with other peers and with experienced coders. More information and apply through the CECAM website at: https://www.cecam.org/workshop-1802.html. Posted on February 18, 2019 at 4:57 pm.